Edgeware Renovations is an experienced, all tradesmen team of painters and decorators in Christchurch, New Zealand. We take up jobs all over Christchurch, including Kaiapoi, Lyttelton, Hornby and some outer Banks Peninsula areas. We have served many happy clients over the years as painters, decorators, plasterers and builders. We’re a friendly, local team and are committed to improving homes and commercial buildings in Christchurch city and the surrounding areas. Our team is fully EQR accredited and have been actively involved in the Christchurch rebuild. Andrew Fox has been working in renovations for over 20 years. Each project he undertakes is completed with care and attention to detail. He personally checks every job by his team of painters and decorators for a professional finish, ensuring all work is up to a high standard and that the client is happy before it’s signed off. Check out our recent project for inspiration and see the latest projects carried out by our team of painters and decorators in Christchurch and the surrounding area. 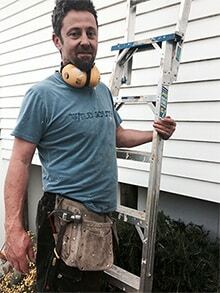 Edgeware Renovations’ owner/operator Andrew Fox has nearly 20 years experience working with and training his team of painters and decorators. Christchurch painters and decorators are not all equal. With full EQR accreditation, Andrew personally checks every job by his team of painters and decorators Christchurch over for a professional finish. He ensures all work is up to a high standard and that the client is happy before it’s signed off. If you’re looking for painters and decorators, Christchurch and Banks Peninsula, call Andrew for a free quote. Our licensed Rockcote applicator has 20 years experience working in solid plastering, together with our Christchurch painters, making him one of the more highly skilled applicators of Rockcote Christchurch has to offer. Many homeowners in recent years have been opting for Rockcote, Christchurch weather can be changeable at best, so make your home weather-tight and crack free.